A mix of old and a little of new, makes for a mighty fine Cast Iron Stew! I like looking at my empty screen and filling it up with my thoughts. It is so fulfilling to look at a white screen, type away and then have something to show for it. However, I have found that filling up a post with words only works if you have words to say. 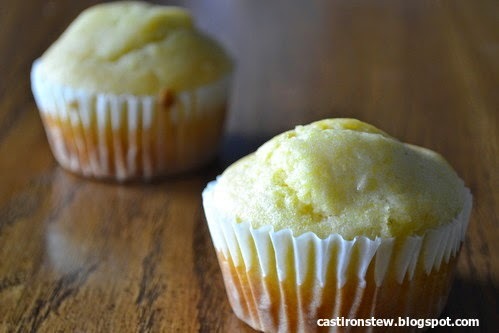 If, for example, you have a cornbread muffin recipe and have nothing good to write about, it doesn't work as well. The pioneers used to call cornmeal "Indian meal". They also called baking soda "saleratus". I eat cornbread with chili. I also like oysters crackers and sour cream on my chili. Oh, and I like shredded cheese on chili, too. We can see cows from our backyard. They make milk that can be turned into cheese. I wonder if I ever ate cheese from those cows. Sometimes, I smell the cows. They don't smell like chili or cheese. They smell like a barn. When the cows moo, it sounds like a cellphone vibrating. Maybe the creator of the cellphone lived on a farm with cows (or at least sang "Old McDonald"). I wonder if the creator of the cellphone, the one who created the vibrating that sounds like a cow, liked cornbread and chili. I do. I like cornbread and chili. Grease a muffin pan or line it with muffin cups. Mix all of the ingredients together, and then pour the batter into the pan. Bake for 20-25 minutes, or until the cornbread is a light golden brown. I Made a YouTube Video! For my very first video tutorial for this blog, I decided to show you how to make an origami towel flower!